Old Delhi known as Shahjahanabad was founded by Mughal Emperor, Shahjahan. He laid the foundation stone for a new capital of his kingdom and Delhi had always remained an important place for the Mughal kings (before Shahjahan), who built palaces and forts in this area. When Shahjahan decided to build the Jama masjid (completed in 1656) and Red Fort (completed in 1648), he summoned many artisans and builders from different parts of India for construction. Shahjahan gave the nearby areas to the families of these artisans and builders to live during the construction. After years of construction, these families permanently lived there. Jama Masjid and Red Fort distance is only 500 Meters and the surrounding area is known as Old Delhi and many labors work here to earn the livelihood. 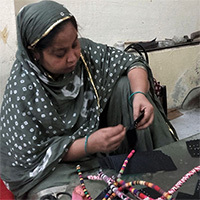 Our artisan community in Old Delhi is very talented group and they make jewelry with variety of material like Glass, Bone, Horn, Stone, Brass and Leather etc. 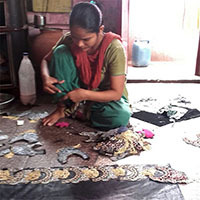 From different states of India, they use loose materials for making jewelry like Necklaces, Cuff, Bracelets, Earrings, Toe-Rings, Finger Rings, Anklets and Headband Headband using Brass, Beads, Bone & Cotton etc. and give it a final look with finishing & electroplating. Master Piece Crafts Artisan Community has 980 artisan members. 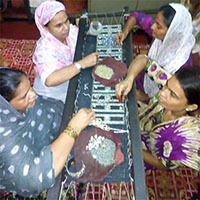 Our Community has both Men & Women Artisans and they are working in their areas with responsibility and credibility.